Getting a job done often demands having the best punch and chisel set possible to remove stripped screws, cut off bolt heads, or punches to set or remove screws or nails. 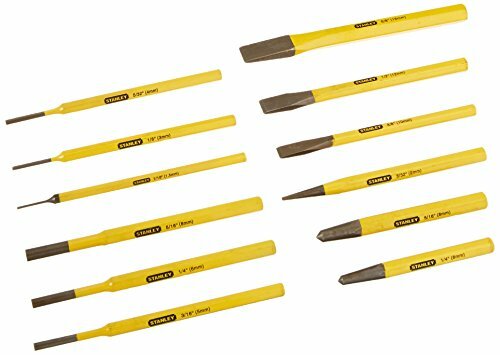 For many people, a basic punch and chisel set is all that’ll ever be needed, including tools like metal cutting chisels and an assortment of punch heads. More dedicated machinists will appreciate a set with a wider range of sizes for greater detail and more precise applications. Here are three great sets worth a look. The OTC 4600 is the best punch and chisel set for people who only need a small selection of everything. 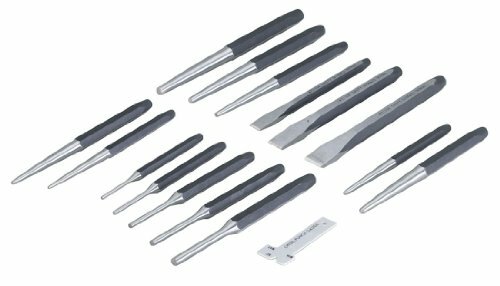 The kit includes several different sizes of cold chisels, hole punches, taper punches and pin punches. The kit includes a little of everything , and weighs only 2.8 pounds, including the handy carrying tray it comes with. The 4600 punch and chisel set is made in the USA, and forged out of tempered steel that resists bending, breaking and chipping. This kit is ideal for the home garage or shop, but it may not have enough sizes for commercial or industrial applications. The hard plastic tray it comes with is not built for heavy use, and will wear out after only a little usage. Other than these two minor complaints there is very little about the OTC 4600 chisel and punch set that would cause you to reconsider buying it. Ask any mechanic what their favorite tool brand is and there’s a good chance GearWrench will be mentioned. Yes, they are more expensive but these tools will literally last a lifetime. If you need a wider selection of tools to choose from, the GearWrench 82306 is probably the best punch and chisel set for you. With 27 pieces, it includes everything you will find in the other top ranked sets, along with more punch types and a lot more sizes of each specific tool. Drop forged steel means the set is durable and capable standing up to the battering and banging a chisel has to take. For easy portability, this set comes in a handy roll-up pouch. The storage pouch probably can’t stand up to constant use, but it is a convenient storage method while it lasts. The Stanley 16-299 punch and chisel set is the smallest entry on the list, but every tool in the set is made under the exacting standards you have come to expect from Stanley Black & Decker. The brightly colored punches are easy to position and easier to locate if you happen to drop one into a dimly lit area. 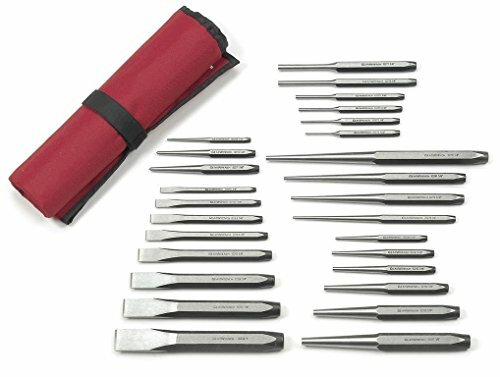 Kit includes 3 sizes of cold chisel and 9 different punches that will work for almost every purpose. The packing card that the kit comes with is not suitable for storage and portability, so you will need to plan on investing in a small tool box or a dedicated drawer in your tool chest. For small shops and home garages, the Stanley 16-299 set is a great value.